The name cotton refers to the general origin of the fiber material as a collective name for various cotton trees or shrubs such as silk-cotton tree, kapok and cotton. Natural recovery of the fiber material cotton from the dehiscent capsules several species of shrubby mallow families (Gossypium). The cultivation is only possible in tropical and subtropical areas ("cotton belt": 35 ° SB to 45 ° NL). In addition to winning the fiber material, the plants are also used for edible oil extraction (seeds) and as protein-rich concentrates (oil cake). Cotton contains more than 80% cellulose. In addition to the water content (6%), it offers pectinates, fats, hemi-cellulose, proteins and minerals (Σ 12%) as fibre accompanying substances. Chemical composition of cellulose: As macromolecule of hundreds of thousands of atoms cellulose as well as starch belongs to the group of polysaccharide. Through photosynthesis thousands of glucose molecules (carbohydrates) are formed from carbon dioxide and water with sunlight and linked via glycoside bonds. These results in rope-like structures, the long chains of (C6H10O5)-monomers are bundled side by side. 1. The cultivation of organic cotton completely abstains from the use of pesticides. 2. At the harvest of the cotton, the environmentally friendly (and social) manual method is preferred. 3. Processing of the controlled biological cultivated cotton abstains from toxic or aggressive chemicals. 4. After the end of its useful life an introduction into the natural cycle is possible, e.g. through composting. Since 5000 years substances for various purposes are made of cotton. 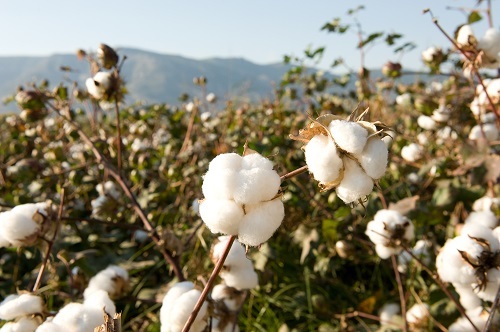 Globally, 75% of all fabrics consist of cotton. Favorable physical properties of the natural product more recently opened it up to other applications as insulating material (sound, heat). structure: The gently treated natural material has a much higher tensile strength and elasticity (persistency!) than e.g. mercerized fabric. Due to the specific processing, cotton is gentle and extremely soft but the skin sympathetic fabric remains cleanable. Without interfering electrostatic effects of the breathable material, the existing high potential to absorb moisture also promotes a comfortable body and sleeping environment. chemically: Unlike "normal" cotton, the material is characterized by the absence of chlorinated pesticides, DDT, lindane and PCP. Quality studies also show that other pyrethroids, pesticides and herbicides as well as toxic paint chemicals are not found! 1. The physical properties have a positive effect on the sleep environment. In total the high lying comfort and active health care can only be achieved through the practice of holistic environmental protection. The entire process of material cultivation meets the highest ethical standards. All components from the holistic environmental effects to social and preventive health care are considered. Quality testing for pollutants: all studied pollutants are undetected, in spite of modern instrumental analysis techniques (gas chromatography, IR spectroscopy). Organic cotton is grown without pesticides and organic fertilizer and meets the stringent requirements of organic farming. In addition, the renewable resource is picked by hand. This means, the job labor market is supported and workers are not exposed to the enormous health burden as the field workers in conventional farming (who may even need to accept poison showers from aircraft) - the average age of those working on cotton plantations is under 40! This is due to the poisoning, as well as the catastrophic living and nutrition circumstances under which under which these people and their families must live. The same is true for conventional coffee - / banana / Rose cultivation (just to mention the most prominent ones). Projects which establish organic farming (most at least) also consider the people, fair pay which allows a 'dignified' life and educational opportunities for children (school until 14, instead of field work from 4). For about 7000 years, sheep are used by people as a source of food and clothing. Also other species suitable for spinning due to their hair length and fineness are used as a wool source: goats, rabbits, llamas, alpacas, camels, etc. The proportion of animal fibers in world wide production nowadays is only about 5% compared to cotton and synthetic fibers. The most important: our wool comes from the Austrian ‘Mühlviertel’, the region around Linz. IT will not be shipped halfway around the world, not treated with insecticides, etc., we know the sheep, at least the shepherd personally. Furthermore we use the finest wool: extracted from the live shearing of Merino sheep. Their coat in comparison to other types of wool (‘fleecy layered’) has a very fine, highly crimped and resilient nature. Chemical composition of the wool: wool(also: hair, nails, horn, feathers) are proteins and like those consist of amino acids. In wool these are 18 different amino acids, whereas the sulfur-containing cysteine caters for the natural curl of hair. A natural accompanying substance in wool is lanolin, which is chemically considered part of the wax groups. The by-product of the wool production, a substance falsely named wool fat, is utilized for application in mild and tolerable ointments or (baby) creams. The living shearing generates the so-called sweat or dirt wool with about 50% impurities (sand, dust, salt, wool wax, etc.). Instead of through aggressive chemical agents, the necessary cleaning step is carried out only with soap. The analysis results of the wool: no findings show that no pesticide baths (against parasites) were applied to the sheep. Main application is the spinnable natural material for knitwear (sweaters, scarves, socks, etc.) and carpets. Because of the special material and climate properties of the natural material, it is also suitable as a component of high-quality mattresses. biological: keratins provide little target points for biological attacks by microorganisms because of their chemical structure. Untampered wool and hair can survive for long periods of time. 1. Absorb large amounts of moisture (and emit!) without the wool feels wet. 2. 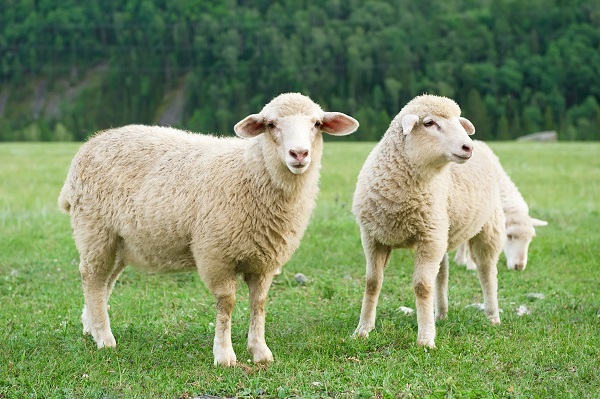 Wool acts as an odor filter that absorbs odors - and hardly picks up dirt. 3. Wool has the best warmth retention properties of all fiber types through air as an insulator. 4. By the crimping of the wool a distance from the skin is always provided, which, for example facilitates the transport of sweat without feeling cold (evaporative cooling). chemically: Wool is relatively chemically inert, resistant to acids and durable under normal environmental conditions. medical: The outstanding physical attributes such are used e.g. for heat treatments in rheumatoid arthritis and other joint diseases. The wool we use has a certificate of origin with the corresponding analytical studies of the chemical composition and physical parameters. All quality information is supported by independent third parties in foreign investigations in addition to the operational self-tests. The Eco-Environmental Institute stands for scientific objectivity and accuracy. The renewable resource wool is obtained with the live shearing. Careful processing of our wool abstains from harsh chemicals. Ecological problems can however arise from the widely practiced, conventional treatment of animals and wool with chemicals: thereby pesticides in big amounts get into in the environment and in the wool! We have created this brand to set an example for clean wool of fair origin. More and more consumers are irritated by the sometimes devestating pictures of industrial sheep breeding occuring overseas - with good reason, we believe. With us, this hasn't been an issue ever since. We are obtaining our wool from Austria since 1989. It originates from the spring shear of individual shepherds which is gathered by regional sheep farming cooperatives and then resold. The sheep that provide the wool for your place of sleep travel in small herds from grassland to grassland, looked after by humans and dogs. Because of that, our sheep's wool meets the quality requirements of controlled biologically animal husbandry in chemical analyses. The quality of the fibres is just like its origin and its purity: soft and powerful. That's important, since sheep's wool has an important and good function in mattresses: ensuring optimal climate and hygiene. This is why a layer of our fine wool always surrounds the core of our mattresses/futons. contains 30-35% rubber components, 60-65% water, proteins, lipids (fats) and carbohydrates with each about 1%. Mineral constituents (ash): 0.5%. The building blocks (monomers) of the rubber are the isoprene units: 2-methyl-1,3-butadiene, (C5H8)n with about n = 3000 units in the backbone (polymer). The isoprene is the preferred component of nature in the animal kingdom (e.g. cholesterol) as well as in the plant kingdom: here the so-called terpenes based on isoprene influence the composition of many beneficial essential oils. Gentle vulcanization of milk for spatial networking of the existing isoprene chains. Generally the application of environmentally harmful CFCs for foaming is renounced. This also applies to abstaining from UV stabilizers. Several additional cleaning steps remove any remaining traces of substances from the manufacturing process. biological: The antibacterial and anti-dust mite properties promise sensitized people relief of typical symptoms of dust allergy (nasal and eye irritation). physically: Various degrees of firmness, point-elastic behavior and high flexibility, breathability and vapor permeable (moisture control) through micro-fine air chambers. As THE rubber elastomer caoutchouc can be stretched up to eight times (!) of its length, but always takes its original shape. chemically: No evaporation of volatile chemicals. No traces of nitrosamines e.g. commonly used in synthetic latex. medical: In addition to the material-specific, reduced germs and mites’ risk, the health-promoting properties of the climatic minimized pollutant - and thus the health preventive -natural materials are to be highlighted. The proven concept of the rubber cups with specially shaped profiles (surface and channels) combines manufacturing technology the high orthopedic standards and comfort in an ideal way with the inherent material advantages. This natural product is finally cleansed from remaining adhering proteins and the radicals vulcanizing agents. We only buy and process certified raw materials which have been tested and verified regarding harmful substances and purity by the ECO-Institut through their producers. Use of the weeping tree has a long tradition. The milky juice can be harvested for decades without harming the plant. In contrast to the production of synthetic rubber products from petroleum the natural way proves to be gentle: minimal resource consumption and minimal emissions during processing. With the idea of sustainable development and the now recognized importance of the rain forest, the wild and uncontrolled deforestation for creating plantations in emerging developing countries is an issue of the past. With the purchase of this natural product, the buyer contributes to environmental protection and development aid. Only a material that has a content of 100% natural rubber merits the term natural latex mattress from us. 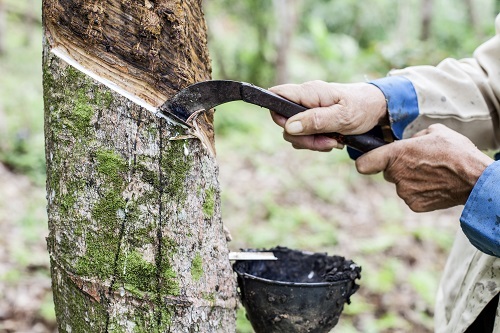 There are unfortunately a lot of products in the market with a Nature-/Synthetic-mix that are sold as natural latex. Also there are features of the 100% natural latex in which however extenders (such as chalk) are added in order to facilitate the production. You recognize these amongst others through the fact that the top and bottom of the core are not equal: closed top and slightly wavy bottom with pin holes. This is natural latex, but the through the extenders it is brittle. Our natural latex is always 100% natural and of high density, because only thus a futon contemporary elastic occurs and because it holds extremely long. Here is the current Certificate from the Eco Institute of the chemical product analysis (according to Qul). Natural materials of vegetable origin. 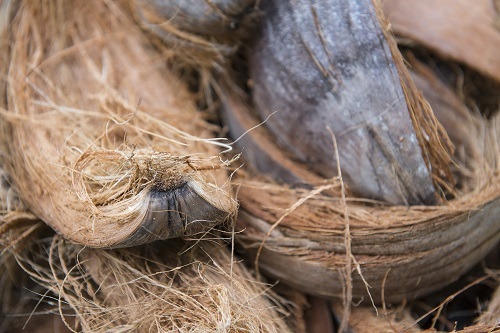 Fruit fibers that are rooted in the hard shell of the coconut. The coconut palm is used with all its components by people: the wood is used as a building material, the fruit as food, fermented and burnt palm juice as an alcoholic stimulant. In addition, coconut fats and oils are obtained for human consumption or for the production of soap and candles from the plant. As the only of all pericarp fibers coconut fiber is also spinnable. As the only species of the genus of feather palm the coconut palm (Cocos nucifera) grows in the entire tropical coastal area. The cultivation is traditionally operated especially in India and Sri Lanka. The coconut fibers are extracted from the bass layer of the coconut. Picking before maturity yields fibers with a lower lignification. By the so-called "toasting" over several weeks in brackish water the fibers can be peeled off. Then they are beaten, stomped, and tumbled to achieve a higher flexibility of the fibers. Finally, 15-35 cm long coconut fibers are washed and dried. Because of its resistance to water, the fiber used to produce hawsers as long as can be remembered. A variety of household items such as brooms, brushes, etc., but also mats and rugs are made from coconut fibers. The resulting yarn quality of the fibers (color, clarity, degree of elongation, thickness, etc.) depends on the degree of maturity of the nuts and the applied roasting and spinning process. As stuffing material it is a highly popular plant alternative as a so-called 'vegetable product horsehair'. Coconut fibers have strong resistance to microbial decay processes (and moisture): due to the lack of fat, they offer no suitable soil for microorganisms. The fibers are very extensible whilst having a low specific gravity. Through the tube structure, they act thermal insulating as well as sound absorbing and are extremely durable. Furthermore, the hygroscopic fibers - depending on the degree of humidity and room humidity – can absorb or emit water. Thereby the material with a moisture-regulating function arises..
the fibers have a high resistance against chemicals (sea water!). The properties of the material have a positive effect on people who respond particularly sensitive to chemical and environmental influences. The low germ density will benefit allergy sufferers. The humidity control generates a pleasant cooling effect when using coir mattresses. While coir is sometimes (absurdly) burdened with e.g. toxic lindane or carcinogenic pentachlorophenol, DDT, formaldehyde etc., we can exclude this from our coconut products. all studied pollutants are undetected, in spite of modern instrumental analysis techniques (gas chromatography, IR spectroscopy). The use of the coconut palm is largely in line with the requirements of modern environmental protection. The undemanding tree needs no intensive treatment, harvested with the same method for thousands of years. In general monocultures are not created for this purpose. The processing of the renewable resource is without harming the environment. In new and innovative projects the coconut wastes are converted by composting it into a valuable organic fertilizer. Fungal cultures help to unlock the strong woody material which otherwise does not well compost without vaccination. The rural and labor-intensive "coir industry" thus fulfills a valuable contribution to the local and global environment and makes a social contribution in stabilizing the cultivating countries. Natural material of animal origin: horse hair from the mane and tail. Horsehair has been used since the beginning of the 19th Century as a cushioning material, distinguished by its spring. The use of the natural materials over the past decades through the use of springs and synthetic foams has strongly decreased. As environmentally friendly material horsehair is now being rediscovered as a raw material with excellent attributes without the chemical side effects. Chemical composition of horsehair: the hair (also: wool, nails, horn, feathers) are proteins and like those consist of amino acids. The group of these protein structures is considered under the chemical term keratins. Despite a very strong structural similarity with wool, horse hair has a greater strength and durability due to the geometry of macromolecules. After the “hair cut" the natural raw material is cleaned with soap. No other chemical agents are used, which may result in damaging the natural self-cleaning abilities of the hair. After purification, the protein fibers are prepared for spinning and finally processed into mats. In addition to the aforementioned use as stuffing, horsehair is also used as a raw material for yarns, threads, and insert-linings. Pure horsehair fabrics are also needed for the production of fine hair nets. The main use of horsehair nowadays is part of quality mattresses, good brooms and textiles. physical: The natural crimp of horsehair mattresses causes for a high filling and spring. In addition the elastic properties of the extraordinarily good, moisture-and heat-regulating functions of the natural material must be mentioned. Another advantage is reflected in the self-cleaning capacity: scents are absorbed by macromolecules and thus "deodorized". chemically: Horse hair like wool is relatively chemically inert and resistant to acids. In comparison to the already durable wool, horse hair is more durable in normal environmental conditions. medical: The physical properties mentioned above can be used medically just as wool. The heat function can have a positive impact on blood circulation and joints. The use of this natural material is largely in line with the requirements of modern environmental protection. With the purchase of this natural product, the buyer contributes to environmental protection and sustainable economy - and avoids synthetic products and their often negative environmental characteristics. Caution! On the market there are synthetically produced, monofilament products with intricate details such as natural horsehair: The Chemical horsehair. Furthermore fiber structures similar to horsehair are obtained from vegetable origin of the dwarf fan palm and Tillandsia. (as well as upholstery, carpets, .....) has become a much smaller problem. At least those affected will no longer need to abstain from natural mattresses and can use the time spent washing mattress covers better. This agent is used under different names commercially (in the pharmacy under Milbapax) and is based on the drug formulation TN-MP-100. This preparation consists of active substances, such as e.g. azadirachtin, which is extracted from the oil of the seed fruits of the neem tree and are highly active effective against mites (arachnids). Long-term tests in the 90s (the substance is on the market since 1998) have shown that the effect of the substance on a new mattress lasts for three years. We recommend house-dust allergic people to treat the mattress for the first time after two years and then annually, whereas a spray bottle (100ml) is sufficient for a mattress size of 100 x 200. The mattress is sprayed evenly on the outside and the inside, (if possible); The slight odor, which originates from the solvent evaporates quickly. The effect of this natural resource is very good! To clarify the allergy-inducing effect and the effect of the agent some information about the mite: There are approximately 30,000 different arachnids. Several dozen of them are listed as local mites. The average 0.15 to 0.5 mm wide and thus barely visible insects that are basically everywhere (!) and therefore unavoidable actually have a useful function, namely the removal of dirt on the smallest scale. Related to man and his environment its effects, the exterminating of skin scales, grease residues, etc., so mostly human protein. Therefore what the mite is excreting is also a form of protein, resulting in an allergic false reaction in the body of an allergic person. The mites, which multiply considerably in the spring (natural rhythm), develop with good food source, such as e.g. a bed which offers massive populations in the five-and six-figure dimension within a few years. Then thus formed excrement creates an impressive size that bothers the house-dust allergic person. The microbial small particles stick to the swirling house dust which we inhale with air and therefore giving the allergy its name. Now if the mattress (the upholstery, carpet) is covered with bio-Neem (TN MP100), the mites take it in during ingestion and therefore become sterile. Secondly, it interferes with their general supply of bitterns (chitin) and leads to the death. Since mites are constantly everywhere and therefore cannot be avoided that they get into even the best-maintained bedrooms, the mite can just be killed this way. The efficiency of the agent is higher than that of 'washing', because the mites, meaning the cause, can be reached. We offer each mattress with bio-Neem equipment, but recommend the cheaper self-treatment of the new mattress. Older mattresses, up to 3 years may also be treated. However, we then recommend the use of double the amount. Material: Neem oil. Natural materials of vegetable origin, oil from the seeds of the neem tree. Origin: The Latin name Azadirachta indica reveals next to this tree inherent ingredients (azadirachtins) the country of origin - India. Previously, the distribution area was limited to the northeastern India, Burma and Bangladesh. As a very undemanding plant, the tree was planted as windbreaks, shade and especially against soil erosion then in Central America, Africa, Hawaii and the Philippines. Chemical composition of neem oil: The ingredients and their concentrations obtained from the seed oil are subject to natural fluctuations, which are typically to be expected in natural products. The traded neem oils consist for the most part of different vegetable oils. As a major chemical component the insect retardant agent azadirachtin (and further, various derivatives of this material group) occurs. The groups of the limonoids in the oil are characterized by the strong fungicidal effects. The proven phenol derivatives in the solutions act on the one hand anti-inflammatory; on the other hand they strengthen the immune system. 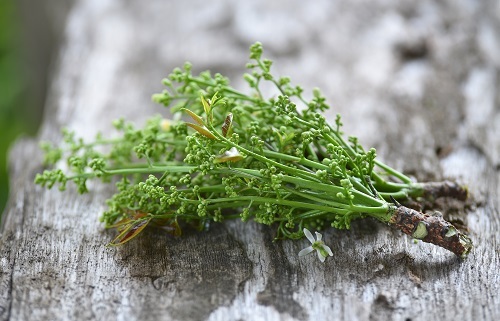 The ingredient salannin acts as a powerful repellent to insects. Production: After ten years a yield of about 50 kg is to be expected from a tree. The seeds contain up to 40% neem oil. First the seeds of the olive-like fruit have to be dried to prevent putrefaction. Afterwards, the oil is increased traditionally by pressing the seed, but also obtained through extraction with solvents. Use: For thousands of years the tree is used daily by the majority of the Indian population. The branches are used as a natural toothbrush against gum and dental disease - in Germany Neem toothpaste and soaps are available for some years. Even as fuel and fodder the plant is utilized, generally, however, the medical and plant health effects are appreciated. The list of these applications and formulations is a mile long: the Neem plant the Indians as a tree for everything. biological: Neem oil is acting as a natural, biological protection against dust mites and other pests such as Moths. Neem extracts can act sterilizing on insects, growth and skinning retardant, but also grub repellant and grub inhibiting. Particularly worth mentioning is the excellent effect on mites: with neem extracts covered textiles remain free of mites for a very long time. chemical: For humans and mammals neem is also non-toxic in high doses and therefore toxically harmless. Medical: Because of its biological effects, neem oil as a sanitizing active ingredient in the preventive impregnation mattresses both for allergy prevention as well as for the symptoms of existing dust allergies eminently suitable. The natural product is used as a drug in a variety of applications, such as for blood purification, insomnia (! ), rheumatism, stomach pain, nausea and many more. Known are also the fungicidal (e.g. against Candida) and antibacterial (e.g. against pyogenics) properties of Neem extracts. But that’s not it: immune-boosting and anti-inflammatory effects can be attributed to neem as well as its prophylactic, anti-viral (e.g. herpes) properties. In the distribution area of the neem tree its components are also used to relieve pain and fever. Quality features: The used neem oil has a certified origin with the corresponding analytical studies on harmful substances and ingredients. The effectiveness and long-term protection of Neem-Protect treatment of textile materials were confirmed by the Institute for Environmental Diseases (Bad Ems). Here the good tolerance of the treated natural latex mattresses for allergy sufferers was also proven. Warranty: All quality information is supported by independent third parties in foreign investigations in addition to the operational self-tests. The Eco-Environmental Institute stands for scientific objectivity and accuracy. Ecology The neem tree is a renewable resource. Already its cultivation contributes to improve the soil and prevents erosion. With the comprehensive naturopathic and medical benefit profile of its ingredients, the plant contains an entire pharmacy. In addition to the comprehensive recycling and neutral CO2 balance of the tree, the use of soft natural chemistry also avoids the application of highly toxic insecticides and may possibly replace synthetic drugs for medical use. Caution: There is now an excessively high number of neem products. The substances of the drug formula TN-MP-100 are standardized unlike many other concoctions which vary greatly in their composition: this guarantees a reliable effective profile against the otherwise very resistant to dust mites.